On the 1st of September 2015, archaeologist, Cecilio Barroso sat before local Spanish press at Lucena City Hall to announce the latest discoveries made at a cave in the outskirts of the small town in southern Spain. The Cave of the Angel Archaeological Project has been going now for twenty years and boasts one of the largest archaeological teams in Spain. As of 2015, over 70 scientists have been involved in the project in various capacities. Each summer brings a new crop of volunteers to the town of Lucena to be a part of an intriguing project. Providing them with experience in the field and the scientists with noteworthy evidence of hominin activity at the cave over the past 500,000 years or so. First discovered in 1995, the Cave of the Angel (locally known as Cueva del Ángel) is cluster of three archaeological sites embedded in a karstic hillside. The cave has revealed zooarchaeological remains, predominantly horse, cattle and deer, some of which featured cutmarks indicative of bone marrow extraction. The site remains a challenge to date, but the faunal evidence thus far, makes this cave system 424,000 years old. Thanks to Uranium Series Disequilibrilium Dating, it can be said with certainty that the Cave of the Angel is at least 121,000 years of age, give or take 11,000 years. So here we have an archaeological complex in southern Spain that featured hominins and other fauna for the best part of half a million years. Hominins occupied this site quite intensely as demonstrated by the wealth of lithic remains. The cave revealed the remains of over 40 Acheulean handaxes, characteristic stone tools of the Middle Pleistocene. The assemblage of stone tools were almost entirely the result of later stages of stone tool manufacture. 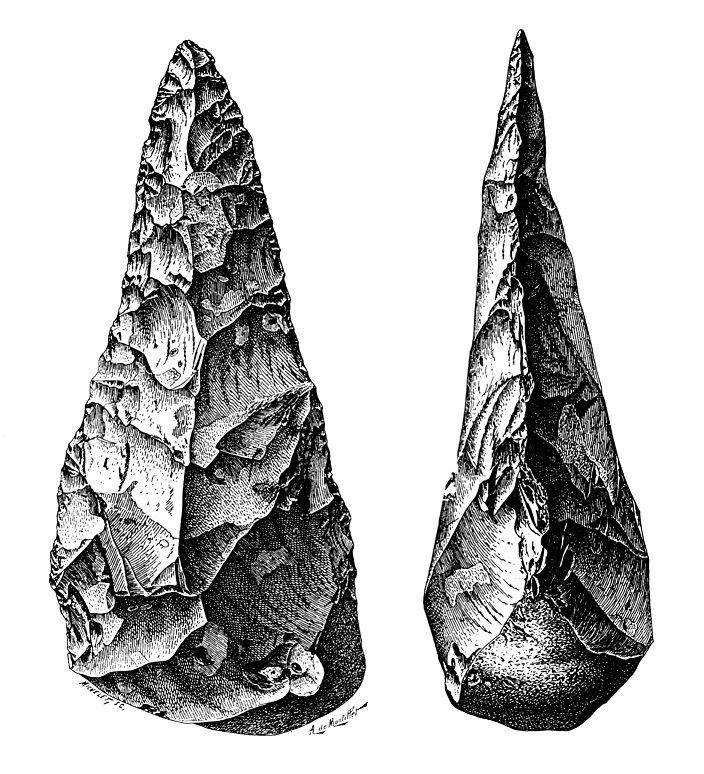 Few had cortex (rough outer layer of rock) and most were found in various stages of retouch, the final phase of a stone tools production process. In 2014, evidence was presented by archaeologists for controlled fire in stratigraphic units 1 to 3. Strata colouration and the presence of hydroxyapatite pointed to this conclusion and this evidence also hinted at the temperatures which could have reached over 600°C. The evidence of a concentrated area of burning as far back as the Middle Pleistocene is controversial, but it is not improbable. It is not known what hominins the cave hosted over the passed 500,000 years. We know that our species Homo sapiens used the cave, but the lack of palaeoanthropological remains at the site makes an attribution very speculative. We know that Homo heidelbergensis evolved from around 700,000 years ago, a hominin that made have provided alot of the Acheulean material at the site. Around about 400,000 years ago, H. heidelbergensis evolved into Homo neanderthalensis in Europe, but their stone tool kit does not feature very strongly at the Cave of the Angel. Imagine you get pieces of a jigsaw puzzle in the post and you are required to make sense of the scene depicted. You know you will never be sent all of the pieces. Now some pieces have black colours and you decide to give those pieces a new name – Homo heidelbergensis – other pieces are pink and you call those – Homo neanderthalensis – This demonstrates the difficulty palaeoanthropologists experience throughout their academic career in their quest to understand our ancestors evolution. The Cave of the Angel was also used during much more recent times also. An open cavity was found to have the remains of humans in sediments around 7,000 years old. Corpses were laid in the cave to decompose. After a time, they were brushed over the edge into a pit to make way for more human remains. Cutmarks and evidence of burning suggests that there was something much more complex taking place here during the Neolithic period. All this sets the scene for the discoveries of 2015 at the Cave of the Angel. The Summer of 2015, brought two new exciting discoveries. Over 15 varieties of seeds were uncovered dating somewhere between 200 and 300,000 years of age. Some were successfully identified as varieties Olive seeds. Dr. Barroso noted that up until 2015, the oldest seeds were pine nuts, no more than 20,000 years of age and these new palynological remains are over 10 times older. Dr. Dorian Fuller of the UCL Institute of Archaeology, an expert on the origins of agriculture, has been enlisted to work on the evidence. The second discovery will be published within the next few months, but Dr. Barroso had time to give some details. The site may feature traces of resin, which could have been used to haft handaxes to wooden handles. Dating to about the same range as the the seeds, residue analysts from the University of Oxford are currently developing a hypothesis based on this new evidence. If you wish to keep up to date on the discoveries of the Cave of the Angel Archaeological Project, why not like their Facebook Page.